Queen Victoria quickly realised that she needed to be married – if only to escape her mother. She complained to Lord Melbourne, “She would never leave me as long as I was unmarried.” He knew of just the way of settling that but was unsure about her first cousin, Prince Albert of Saxe-Coburg and Gotha, who had visited her several times before. At this time, Victoria was not in love with Albert and remembered him as a shy young man. She also refused to be rushed into marriage. “I may not have the feeling for him that is requisite to ensure happiness. I may like him as a friend, and as a cousin, and as a brother, but not more. 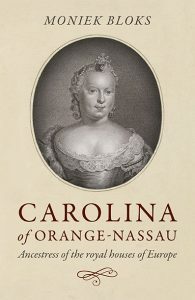 I am anxious that you should acquaint Uncle Ernest (Albert’s father), that if I should like Albert, that I can make no final promise this year, for, at the very earliest, any such event could not take place till two or three years hence”, she wrote to her uncle King Leopold I of the Belgians. On 10 October 1839, Albert arrived with his elder brother at Windsor Castle. When they arrived, Victoria was delighted and later wrote, “It was with some emotion that I beheld Albert – who is beautiful, so excessively handsome, such beautiful eyes, an exquisite nose, and such a pretty mouth with delicate mustachios and slight but very slight whiskers; a beautiful figure broad in the shoulders and a fine waist.” Her early writings were promptly forgotten; she was in love. She later wrote to uncle Leopold, “Albert’s beauty is most striking, and he is most amiable and unaffected – in short, very fascinating.” Just five days later she had made up her mind. She later recorded in her diary, “I said to him that I thought he must be aware why I wished him to come, and that it would make me too happy if he would consent to what I wished (namely to marry me); we embraced each other over and over again and he was so kind, so affectionate, Oh! To feel I was, and am, loved by such an angel as Albert was too great a delight to describe. He is perfection, perfection in every way – in beauty – in everything! I told him I was quite unworthy of him and kissed his dear hand.” Her mother was not told until a month later. 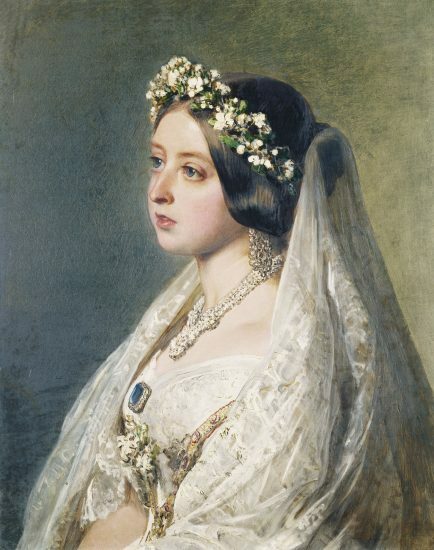 In January, Victoria announced to parliament the news of her engagement and wanted her new husband to be accorded a status above all other English peers, including her uncles. However, ministers disagreed and also refused to grant him £50,000 a year for life. They eventually settled on £30,000 a year for life but Victoria was furious and considered it “an outrageous insult.” Her only victory was the precedence, which was eventually agreed. Victoria planned her own wedding dress and the design for the lace was destroyed so that it could not be replicated. One hundred various cakes were ordered of which only two were to be consumed on the day and the others distributed to others. Victoria also designed a brooch to be given to her twelve bridesmaids. On 28 January, Albert began his journey back to England and arrived on 8 February. A banquet was thrown in his honour and he managed to stay awake past his usual early bedtime. On the morning of the wedding, Victoria wrote in her journal, “Monday, February 10 – the last time I slept alone.” After breakfast, Victoria dressed in her white satin gown trimmed with orange flower blossom. She wore her Turkish diamond necklace and earrings and a sapphire brooch she had received from Albert. She wore a lace veil and a wreath of orange blossoms – the symbol of purity. Unfortunately, the weather was absolutely dreadful that day and at 12.30 Victoria departed for St James’s Palace and met with her train-bearers in the dressing room of the Chapel Royal. Once inside the chapel, Victoria was led past her guests by Lord Melbourne carrying the Sword of State and her uncle, the Duke of Sussex. Albert waited at the altar with his brother and father. Victoria promised to honour, cherish and obey her husband and to forsake all others. 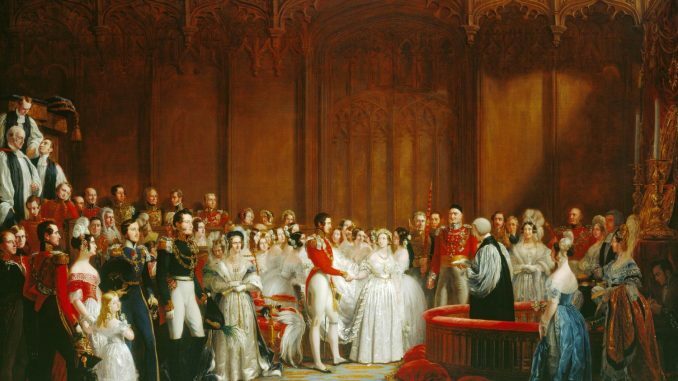 Just after one o’clock, the procession made its way back to Buckingham Palace and once there, Victoria was able to give him his wedding ring (there had been no place in the service for his ring). Afterwards, they had a wedding breakfast and the huge wedding cake was brought in. Then Victoria changed into her travelling outfit and had a private meeting with her Prime Minister. Around 4 in the afternoon, the newlyweds departed for Windsor Castle where they enjoyed their wedding night. Thank you indeed for this wonderful site…I love it and enjoy it all.